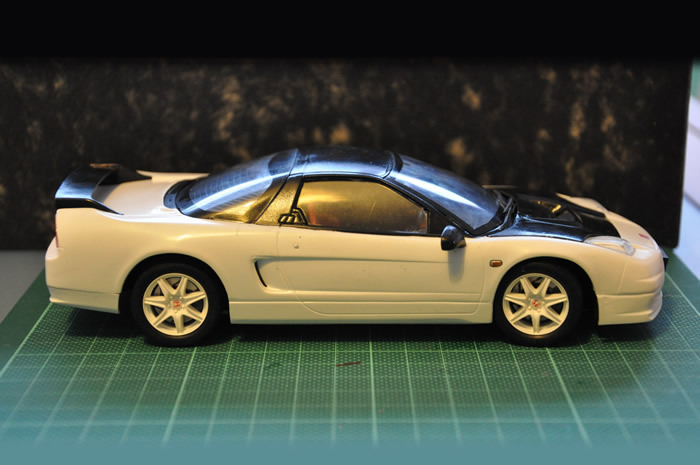 Fujimi Honda NSX-R 1/24 scale. Photographs. Fujimi Honda NSX-R completed in December 2010 . Click Thumbnail below to view larger image. Oh, how I hate this kit. I wanted to put a hammer through it at the end. Whilst the engine, interior and chassis are just fine, there is no "fit" with the body parts. They just go next to each other. The windscreen for example is just one piece (all the glass is separate pieces), and just fits inexactly into the windscreen shaped hole, no tabs, lugs, mounting points, nothing. Copious amounts of messing, superglue and stuff later, and I have a complete but inelegant build compared with the last few I did. It's a real shame since the engine and interior came out so well, even compared with other kits I've done. I decided to go with the black "prototype" bonnet instead of the usual white. You can find the Black-bonnet car in Gran Turismo.